Here are the ratings for Hell on Wheels, the new TV series that revolves around the construction of the first transcontinental railroad. 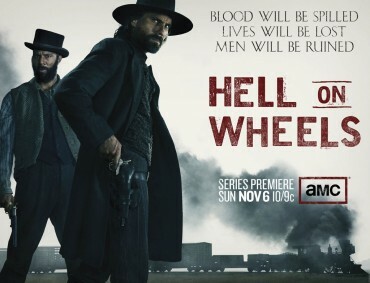 The first season of Hell on Wheels airs Sunday nights at 10pm on AMC. 0.7 in the demo (0% episode-to-episode change) with 2.84 million. Season average: 0.99 in the demo with 2.98 million. 0.7 in the demo (0% episode-to-episode change) with 2.29 million. Season average: 1.02 in the demo with 2.99 million. 0.7 in the demo (+17% episode-to-episode change) with 2.51 million. Season average: 1.06 in the demo with 3.08 million. UPDATE: Hell on Wheels has been renewed for a second season. 0.6 in the demo (0% episode-to-episode change) with 2.27 million. Season average: 1.11 in the demo with 3.16 million. 0.6 in the demo (-25% episode-to-episode change) with 2.15 million. Season average: 1.20 in the demo with 3.31 million. 0.8 in the demo (-33% episode-to-episode change) with 2.70 million. Season average: 1.32 in the demo with 3.54 million. 1.2 in the demo (0% episode-to-episode change) with 3.28 million. Season average: 1.45 in the demo with 3.75 million. 1.2 in the demo (-20% episode-to-episode change) with 3.52 million. Season average: 1.53 in the demo with 3.91 million. 1.5 in the demo (-21% episode-to-episode change) with 3.84 million. Season average: 1.70 in the demo with 4.10 million. 1.9 rating in the 18-49 demographic with 4.36 million total viewers. Season average: 1.9 in the demo with 4.36 million. What do you think? Do you like the Hell on Wheels TV series? Do you think it should be cancelled or renewed? If this show is cancelled I will no longer watch tv. This is one of the best western series to come along in ages and my wife and I feel it is in our top three shows. Good writters and excellent actors. Who in the hell decided o cancel a show with so much potential????? Right on Velma this is a must keeper. As the article states, the show has been renewed for a second season. I agree 100%. This is truely one of the best western series of the early days in America ever. ARe you kidding me?! This is one of the BEST dramas on tv! My husband and I absolutely love the show. I would give it an “A” rating. We did notice that a few of the stars speak real low and when the music is being played, at the same time, it is drowning out the actors voices, making it hard to understand what they are saying. Please don’t play the music so loud so we can determine what they are saying. I really like the show. It is interesting watching the different racial groups interact as they build the railroad and also to see how they are reacting to finding out that the Asians who were building a competing railroad were finishing faster than they were. I really like this show. Each episode makes me like it a little more each time. Um, why would you put TV show ratings for a cable TV show? Ross » Because they are the biggest factor in determining if a show will be cancelled or renewed.